Need a little help explaining health to your kindergartner? 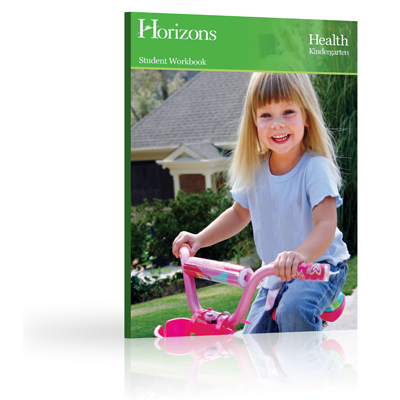 Alpha Omega Publications has just what you need—the Horizons Kindergarten Health Teacher's Guide! Clear and easy to use, this comprehensive step-by-step teacher's guide is a required component for successfully teaching your child age appropriate health topics in the Horizons Kindergarten Health Student Workbook. This handy, softbound guide comes with many time-saving tools like a step-by-step curriculum overview, a section on how to use the curriculum, a Horizons Health Scope & Sequence, and a complete list of health education resources! Divided by units, this homeschool teacher's guide outlines each unit's lessons, goals, background, use of puppets, vocabulary terms, and resources. How great is that? And there's more! All required materials, lesson objectives, background information, lesson directions, and activities are listed for each individual lesson too. Health topics covered are living in a family, getting along with others, taking care of the body, being safe, and preventing health problems. And on top of that, this guide, designed to be taught two to three days per week, comes with some fun, sing along musical selections that correlate with lesson material. What more could you need? Don't worry any longer about how to teach health to your kindergartener! Everything you need is here in the must-have Horizons Kindergarten Health Teacher's Guide! So don't delay. Order today!